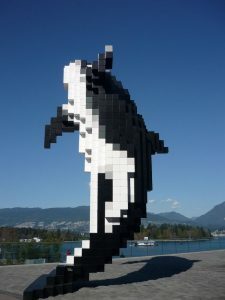 Digital Orca (2009) is a public art piece by Douglas Coupland, located in Vancouver, BC. Guilhem Vellut, CC BY 2.0, via Flickr. Studying Generation A? Check out the CanLit Guides chapter “Douglas Coupland’s Generation A: Storytelling in a Digital Age” by Shannon Smyrl. Douglas Coupland’s 2009 novel Generation A exposes and probes core cultural anxieties related to isolation, mass commercialism, and environmental destruction—threats that feel imminent in our current digital world. As you study Generation A , look beyond this surface to consider how the thriller narrative is linked to the novel’s larger concern with storytelling. Because, ultimately, the novel is a story about storytelling, structured as five interconnected narratives, each with embedded “campfire” stories the characters tell each other. In the end, the characters’ sharing of stories is integral to the novel’s outcome.